The cot–caught merger (also known as the low back merger or the LOT–THOUGHT merger) is a phonemic merger, occurring in some dialects of the English language, between the phonemes that are conventionally represented in the International Phonetic Alphabet as /ɔː/ (which is usually spelled with au, aw, al or ough as in caught and hawk) and /ɒ/ (which is usually spelled with o as in cot and hock). In varieties in which the merger has taken place, including a few in the British Isles and many in North America, what were historically two separate phonemes have fallen together into a single sound, so that caught and cot, as well as several other pairs of words, are pronounced identically. In most North American varieties this merger occurs along with the father–bother merger, leading to a loss of distinction between /ɔː/ in caught, /ɒ/ in cot and /ɑː/ in father. ah awe ɒː With father-bother merger. dog dawg ˈdɒːɡ dawg is a dialectal word arising from dog. god gawd ˈɡɒːd gawd is a dialectal word arising from god. la law ˈlɒː With father-bother merger. on awn ˈɒːn Without lot-cloth split. Pa paw ˈpɒː With father-bother merger. Pa's pause ˈpɒːz With father-bother merger. Pa's paws ˈpɒːz With father-bother merger. shah shaw ˈʃɒː With father-bother merger. 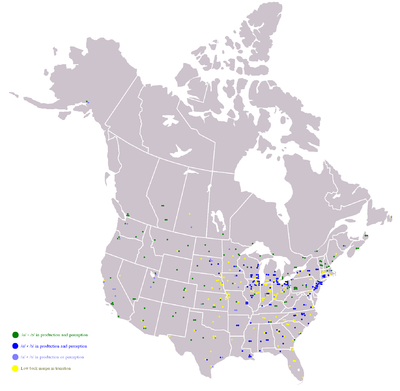 On this map of English-speaking North America, the green dots represent speakers who have completely merged the vowels of cot and caught. The dark blue dots represent speakers who have completely resisted the merger. The medium blue dots represent speakers with a partial merger (either production or perception but not both), and the yellow dots represent speakers with the merger in transition. Based on the work of Labov, Ash and Boberg. Nowhere is the shift more complex than in North American English. The presence of the merger and its absence are both found in many different regions of the North American continent, where it has been studied in greatest depth, and in both urban and rural environments. The symbols traditionally used to transcribe the vowels in the words cot and caught as spoken in American English are ⟨ɑː⟩ and ⟨ɔː⟩, respectively (though often without the length marks: ⟨ɑ, ɔ⟩), although their precise phonetic values may vary, as does the phonetic value of the merged vowel in the regions where the merger occurs. Even without taking into account the mobility of the American population, the distribution of the merger is still complex; there are pockets of speakers with the merger in areas that lack it, and vice versa. There are areas where the merger has only partially occurred, or is in a state of transition. For example, based on research directed by William Labov (using telephone surveys), younger speakers in Kansas, Nebraska, and the Dakotas exhibit the merger while speakers older than 40 typically do not. The 2003 Harvard Dialect Survey, in which subjects did not necessarily grow up in the place they identified as the source of their dialect features, indicates that there are speakers of both merging and contrast-preserving accents throughout the country, though the basic isoglosses are almost identical to those revealed by Labov's 1996 telephone survey. Both surveys indicate that approximately 60% of American English speakers preserve the contrast, while approximately 40% make the merger. Further complicating matters are speakers who partially make the merger, whether by perception or production, or make the merger when the words are spoken unstressed or casually but not when they're stressed. Speakers with the merger in northeastern New England still maintain a phonemic distinction between a fronted and unrounded /aː/ and a back and usually rounded /ɒː/, because in northeastern New England (unlike in Canada and the Western United States), the cot–caught merger occurred without the father–bother merger. Thus, although northeastern New Englanders pronounce both cot and caught as [kɒːt], they pronounce cart as [käːt]. Labov et al. also reveal that, for about 15% of respondents, a specific /ɒ/–/ɔː/ merger before /n/ but not before /t/ (or other consonants) is in effect, so that Don and dawn are homophonous, but cot and caught are not. In this case, a distinct vowel shift (which overlaps with the cot–caught merger for all speakers who have indeed completed the cot–caught merger) is taking place, identified as the Don–dawn merger. The "Northeast Corridor" along the Atlantic coast, ranging from Baltimore to Philadelphia to New York City to Providence (but not to Boston or anywhere north of there). The second technique of resistance to the merger is the raising of the THOUGHT vowel /ɔː/ found in the New York City and the mid-Atlantic region's accents. In areas that don't use this technique, sometimes /ɔː/ is pronounced closer to [ɔ̝ː]. On the contrary, in this technique, either /ɔː/ retains its historical high (raised) value [ɔː], or it is raised even higher to [ɔə⁓oə], or (in the extreme case) even [ʊə]. The third technique is found in the South. This is the result of vowel breaking in Southern American English, where /ɔː/ is broken to [ɒʊ], keeping it distinct from the LOT vowel. Many Southerners, however, are beginning to embrace the merger, particularly Southerners who are younger or urban. Theories of the origin of the merger exist, with two competing scenarios. One group of scholars argues for an independent North American development, while others argue for contact-induced language change via Scottish immigrants (e.g. Dollinger 2010), in which a role is afforded to Canadian English, where the spread from East to West was completed more quickly than in the US. Others consider the issue unresolved (Boberg 2010: 199?). In London's Cockney accent, a cot–caught merger is possible only in rapid speech. The THOUGHT vowel has two phonemically distinct variants: closer /oː/ (phonetically [oː ~ oʊ ~ ɔo]) and more open /ɔə/ (phonetically [ɔə ~ ɔwə ~ ɔː]). The more open variant is sometimes neutralized in rapid speech with the LOT vowel /ɒ/ (phonetically [ɒ ~ ɔ]) in utterances such as [sˈfɔðɛn] (phonemically /ɑɪ wəz ˈfɔə ðen/) for I was four then. Otherwise /ɔə/ is still readily distinguished from /ɒ/ by length. Outside North America, another dialect featuring the merger is Scottish English. Like in New England English, the cot–caught merger occurred without the father–bother merger. Therefore, speakers still retain the distinction between /a/ and /ɔ/. ^ a b Wells 1982, p. ? ^ Gagnon, C. L. (1999). Language attitudes in Pittsburgh: 'Pittsburghese' vs. standard English. Master's thesis. Pittsburgh: University of Pittsburgh. ^ Dubois, Sylvia; Horvath, Barbara (2004). "Cajun Vernacular English: phonology". In Kortmann, Bernd; Schneider, Edgar W. A Handbook of Varieties of English: A Multimedia Reference Tool. New York: Mouton de Gruyter. pp. 409–10. ^ "Singapore English" (PDF). Videoweb.nie.edu.sg. Retrieved 2016-12-12. ^ "Map 1". Ling.upenn.edu. Retrieved 2016-12-12. ^ Dollinger, Stefan (2010). "Written sources of Canadian English: phonetic reconstruction and the low-back vowel merger". Academia.edu. Retrieved 2016-03-19. ^ Boberg, Charles (2010). The English language in Canada. Cambridge: Cambridge. pp. 199?. Barber, Charles Laurence (1997). Early modern English (second ed.). Edinburgh: Edinburgh University Press. ISBN 0-7486-0835-4. Labov, William; Ash, Sharon; Boberg, Charles (2006). The Atlas of North American English: Phonetics, Phonology, and Sound Change: a Multimedia Reference Tool. Berlin ; New York: Walter de Gruyter. ISBN 3-11-016746-8.